In Spanish, and in English, we do not only use subject pronouns for the subject of our sentences. Sometimes you combine a group of people or use names instead of the subject pronoun. The chart to the left is an example of mixed subjects. You can compare it to the subject pronoun chart. If you substituted a subject pronoun for the phrase in the middle - what would the subject pronoun be? What makes the phrase nosotros? What makes the phrase ustedes? 2. View the prompt at the top of the game. 3. Have the fish go to the worm with the correct meaning. 4. Click the mouse to have the fishy eat the correct word. There are group of practice activities that will help you practice for mixed subject pronouns. 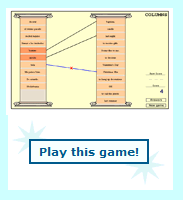 One of the Quizlet Activities is also embedded below. 1. Answer the question correctly for subject pronoun substitution. 2. Select a space ship. 3. Use the arrow keys to steer clear of the falling asteroids. 2. Bat the rat of the subject pronoun that would replace the subject.